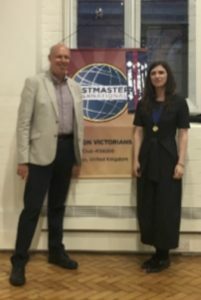 Welcome to London Victorians Toastmasters Club! 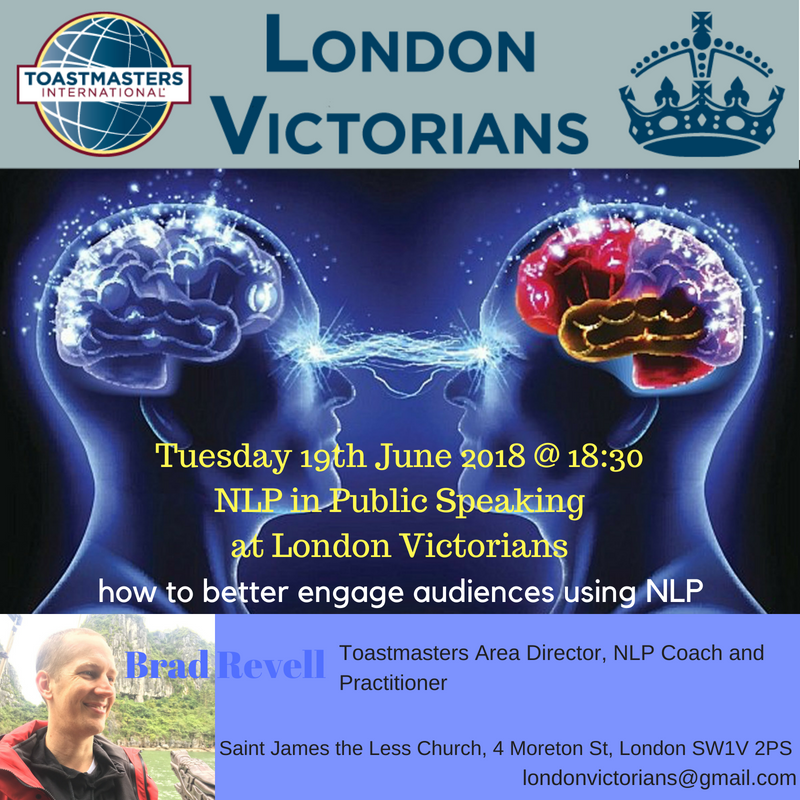 London Victorians is a public speaking club based in Victoria, London. We are part of Toastmasters International, a non-profit organisation founded by Ralph Smedley in 1924 for developing one’s public speaking and leadership skills through practice and peer to peer feedback. theme for the night’s meeting was ‘Remembering the first time’, recalling moments when we do something for the first time. 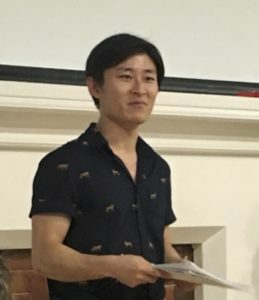 And what better way to start the evening by our President Nuala celebrating the club’s newest members Motsabi Rooper, Yue Cao, Joseph Omeiza (pictured below) and Ariel Elboim. 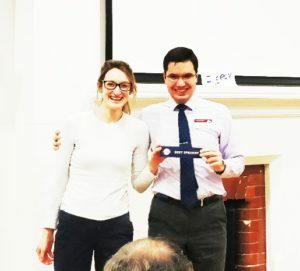 Alongside the introduction to the club’s newest members came a celebration of the club’s long serving members who have served the club in outstanding fashion over the past year; Fahad Alturkait who had set up the mentor scheme and Pascale Monteil who ran the club’s questionnaire to find out what our club’s members wanted. Following these introductions, the meeting entered the speech section. The first speaker was Arsen Shnasev gave a speech entitled By all means, Marry! This speech gave us a humorous insight into the institution of marriage. 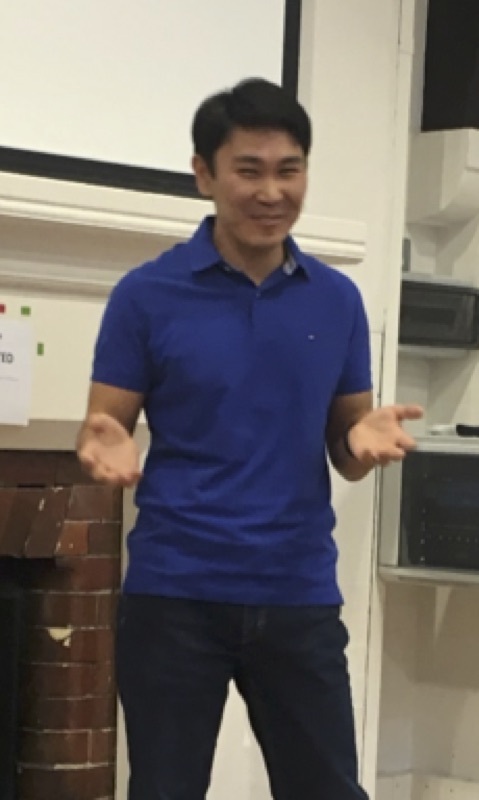 Arsen delivered some memorable analogies which included comparing marriage to cooking, even comparing people in unhappy marriages to philosophers! 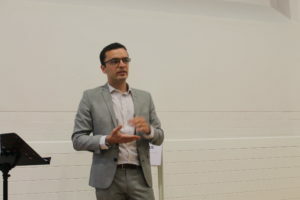 His speech lasted for 7 minutes and 24 seconds and was evaluated by Mohammed Salih who highlighted the speeches structure and use of quotes and statistics as the strong points. 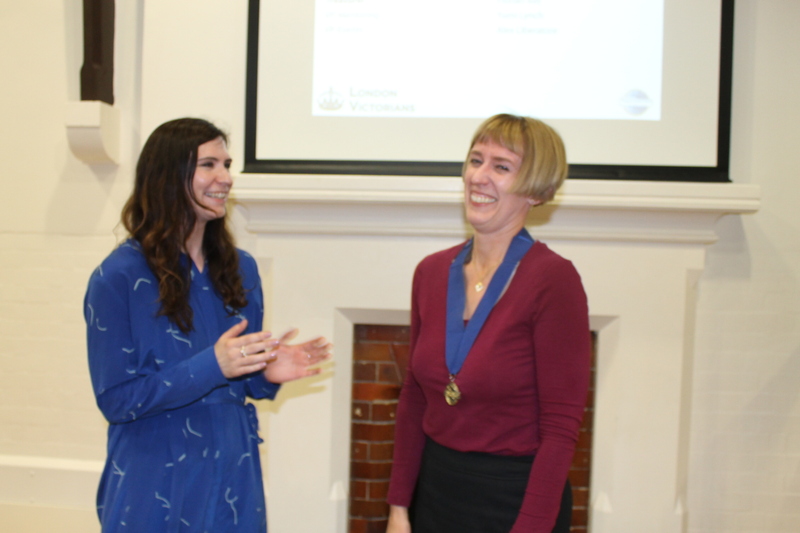 The second speech was by a visitor to London Victorians – Elodie Allion who gave a speech entitled Networking. 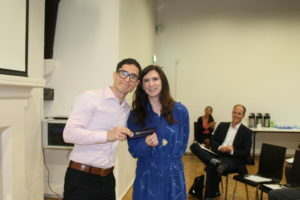 This speech gave us a useful background on the value of networking and also provided us with useful tips on how to get the most out of the various networking scenarios we find ourselves in. Elodie spoke for 6 minutes and 45 seconds, and the speech was evaluated by Georgie Williams who praised Elodie’s super practical tips and the various speech tactics she used to persuade the audience. 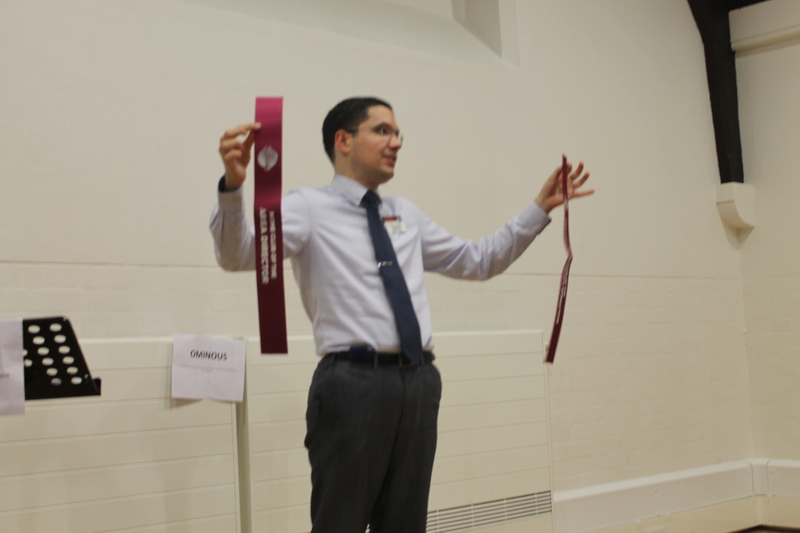 The third and final speech was by our veteran toastmaster Florian Bay. This was an advanced speech from the Public Relations Manual. Florian played the role of the UK Prime minister responding to an unprovoked nuclear attack during World War III. 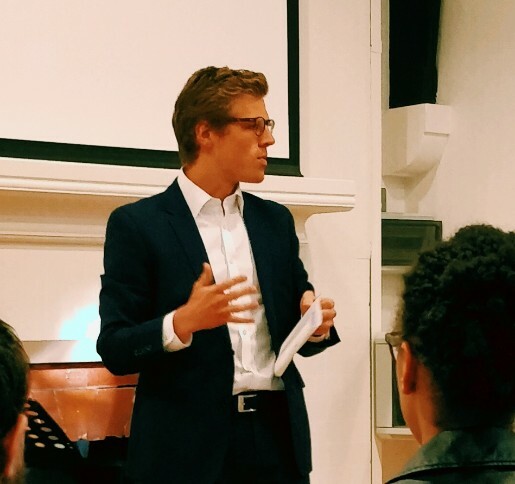 After Florian’s speech, Florian had to field difficult questions from an attentive and slightly distressed audience ranging from Martial Law, Food rationing, International Diplomacy and Conscientious Objectors! All in a day’s work for a wartime leader, who needs to see a blockbuster action film when we have our very own Florian Bay! 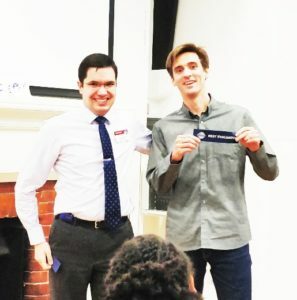 The speech lasted for 6 minutes and the question phase lasted 4 minutes 12 seconds and was evaluated by Pascale Monteil who commended the emotional connection Florian was able to make and his ability to uplift the nation during a difficult time. 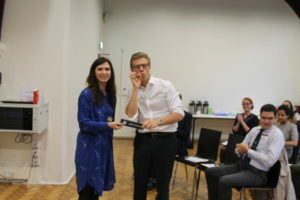 This speech earned Florian the Best Speaker award and Pascale the Best Evaluator speech as voted by the meeting attendees. After the speeches, our Sargent-at-Arms introduced the 12 guests to the club. A great sight to see as the London Victorians club once again demonstrating our ability to attract new people. The second part of the session was a special workshop hosted by Brad Revell who gave us a workshop on Neuro Linguistic Programming (NLP). 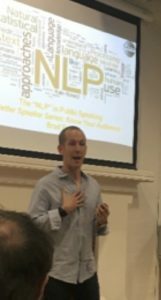 Brad explained the meaning of NLP as ‘A relationship between successful patterns of behaviour’. And during the workshop Brad shared insights into how we can use techniques of NLP to become more effective public speakers, going into some depth on how each part of the phrase Neuro Linguistic Programming relates to the different aspects of speaking. 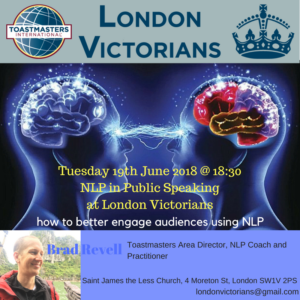 The tips could be applied to both beginner and advanced speakers and the London Victorian’s club will provide plenty of opportunities to apply these valuable methods! 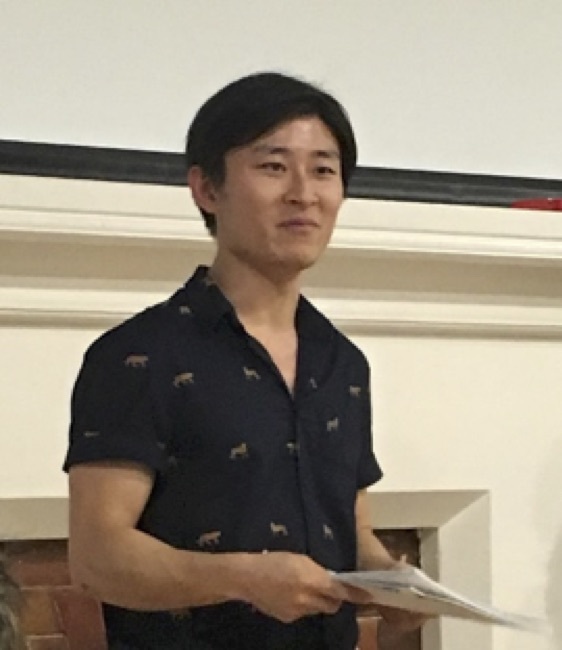 After Brad’s workshop, Yumi introduced our General Evaluator for the club as Andy Hammond who commended our club on our energy and enthusiasm and on the creative and informative speech titles. 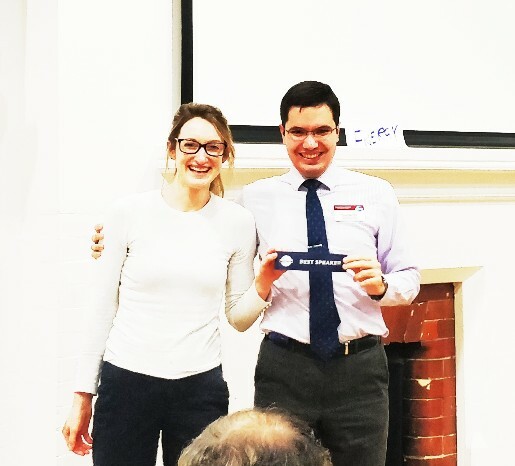 Yumi then handed the meeting back to our Club President Nuala who announced an award achieved by one our club’s most distinguished Toastmasters; Fahad Alturkait achieved the Triple Crown Pin Award given to members who achieve three education awards in a single program year. This is an immense achievement which also proves to show that you are never too experienced to achieve something for the first time! Members and guests began trickling in at 6:30 pm, socializing over tea and coffee and sharing stories of the various paths that led them to Toastmasters and what they aim to achieve. The time is 6:45 pm and just like the rumbling of a Porsche turbo engine, 3,2,1, with a Loud bang of the gavel from the firm hands of Florian; the acting President and Toastmaster for the day, we were off to an explosive start to what would be an energetic Tuesday evening at London Victorians Toastmasters club meeting. Florian gave the president’s welcome address drawing on the history of Toastmasters International and the vision of the organisation to improve the art of public speaking and leadership of its members. *See table below. Slickly swiftly switching into his second role for the day, Florian as Toastmaster (meeting Host/coordinator for the day) explained how the next 2 hours would unfold broken into 5 main parts namely; Prepared speeches, Evaluations of prepared speeches, Welcome of Guests, Table Topics and Evaluations of Table Topics. Florian went ahead to introduce his team of helpers for the the day who came out to explain their roles for the meeting. Ariel Time Keeper Using a Red, Amber and Green Signal,ensures speakers keep to time and gives a report on how they performed with respect to timing of their speech. Actual time of the speeches for the night. 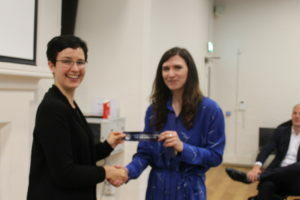 The table topics were also timed and a report was given by the Time keeper. All speakers kept to time. Luke Grammarian Keeps track of creative use of the English Language and give a report. The word for the day was Energy. Joseph Meeting Reporter Covers the activities of the evening to update the website to keep our guests up to date on the activities of the club. Thomas General Evaluator Gives a general feedback on the day and evaluates speakers that may not have had the chance to receive feedback like those who held official roles in the meeting. At 6 mins 54 seconds, the first prepared speech by Paulina, titled “Fail to Improve” gave an example of 3 “successful” individuals Thomas Edison (known for the Light Bulb) Jeff Bezos (known for Amazon) and Charles Dickens (known for the Christmas Carol) whose success came after many failures. Her speech went on to explain that they had one thing in common, they had no fear of failure. She rounded up the speech by encouraging the audience to embrace failure as a natural path to success. 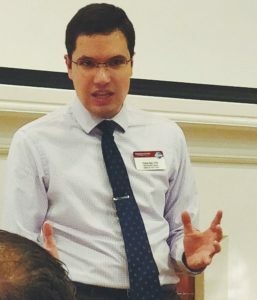 At 6 mins 24 seconds, Andrew gave the second prepared speech for the day titled “Music & Active Listening”. Great speakers are active listeners he asserted and went ahead to provide scientifically back claims on how the brain processes listening to a speech and music the same way. Thus, by actively listening to music, we will invariably build our active speech listening skills which will ultimately move us further along the path of being better public speakers. 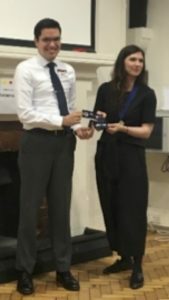 Anna gave the last prepared speech of the day at 6 mins 13 seconds and won the best speech prize.Titled “Not all mice chew through your floor board”, the aim was to challenge the speaker in the use of natural expressive body language in communicating and Anna did that brilliantly. The theme of Anna’s speech was home DIY and how with inspiration, right tools and time, one can transform their homes in a cost effective way. 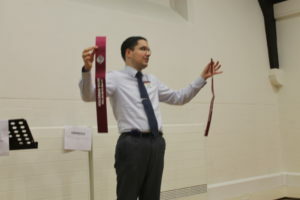 With Speeches completed, the audience voted for the best speech which Anna won. The Next part of the evening was the evaluations of the prepared speech which was done in a timely manner with the evaluators giving the speakers feedback on their speech; highlighting positive aspects and areas of improvement. Rob won the best Evaluator speech. Mayur, The Sergeant at arms welcomed all our guests (non-club members) to the meeting and had them introduced themselves and why they came along. There were 9 guests in attendance. After a 10 minutes break, we were off to an exciting part of the meeting called the table topics anchored by Ayokunle, Table topics are impromptu speeches anyone can participate in. 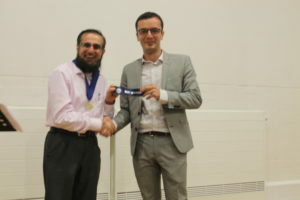 The speech topic is only revealed as the speaker gets on stage. This is a very interesting was to challenge yourself in thinking on your feet at so short a notice. With 7 table topic speeches, Jackie did an amazing job in evaluating all of them in the 4 minute slot allowed to feedback to the speakers. She was excellent. 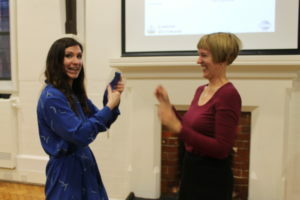 Luke subsequently gave the grammarian report and then the eagerly awaited Harkmaster’s game was played testing the attentiveness of the audience with sweets hurled across the room to the fastest person to answer correctly a question based on the speeches from the evening. As the meeting began to slow to a fine conclusion, Thomas, the general evaluator for the day gave an overall feedback on how the evening went and stressed the importance of exploring the “How” and “Why” when speeches are given especially when evaluating other speakers. The meeting was now back in the firm control of the able Toastmaster and acting president and with another loud bang of the gavel, Florian declared the 12th June 2018,Tuesday evening London Victorians Toastmasters club meeting closed. Best Evaluator Award Thomas R.
I wonder who is happier? Our President, Nuala welcomed members and guests. 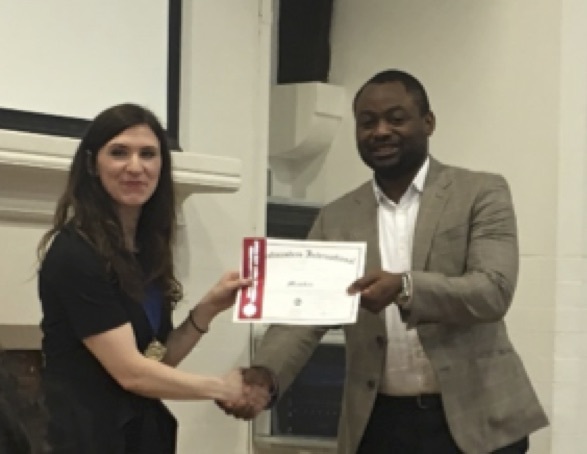 She told us how she joined Toastmasters as she needed to learn how to be more confident when presenting design concepts when the content is not always objective. 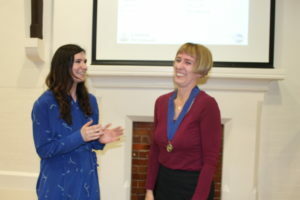 At Toastmaster she found a group of like-minded and supportive people. She believes that in addition to having a purpose you need to have a voice to be able to act on your purpose. Our charismatic Toastmaster for the evening was Andy T. His theme was the importance of community as communities shape our identity. Our timekeeper was Thomas M, from the Greenwich community, the home of time. 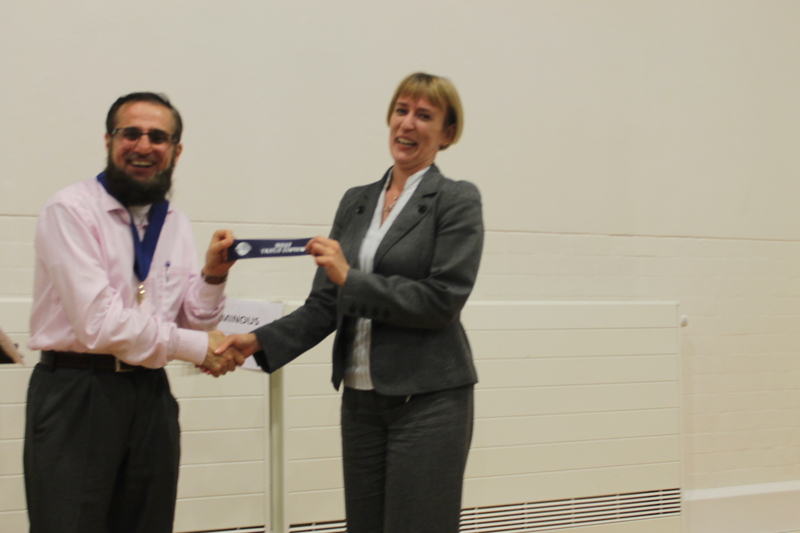 Our first speaker was Zahndri with her first ice breaker speech on the new Pathways training programme. She told us how she had learnt important lessons of teamwork from her failed relationships because everyone needs a team. Luke was delivering his first speech. He had been trying to prepare his speech one Sunday and was on his 9th iteration when he realised he was ‘making a meal of it’ and this became the inspiration for the final version of his speech. 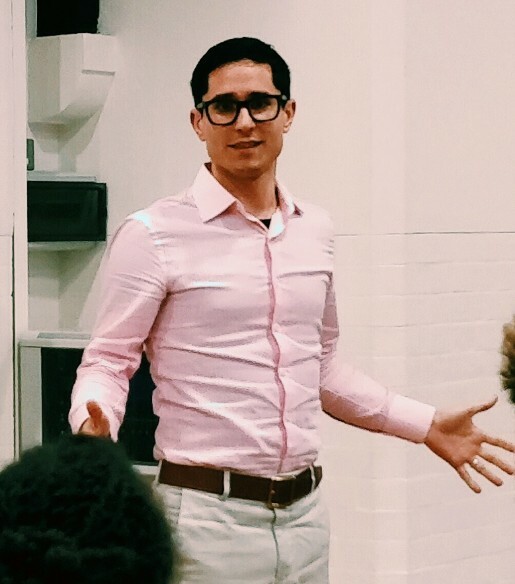 William delivered a speech called Movement is Medicine to practice before he delivers it at a TEDx event in London. Next, we had evaluators; Mohammed, Thomas R and Ahmed, who evaluate the speeches so we can all pick up tips on how to improve our own speeches. Evaluators give each speaker commendations and recommendations. Using detail in a speech makes it memorable, e.g. not having a KitKat in my lunch box at school when all the other kids did. This evening was slightly different from normal as we concluded with our AGM, making decisions on how our club is run and electing the new committee. Marko Salopek delivering his speech What would you do if you weren’t afraid? 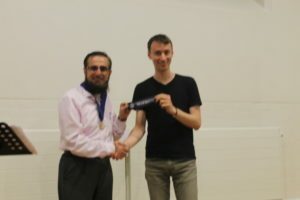 Speech evaluator Mohammed declared that Alex did “an awesome job” with his speech. Also presenting the inaugural project from Innovating Planning, Marko displayed excellent leadership as he stepped in to take up the second speech slot which had become free earlier in the day due to a last-minute cancellation. With less than an afternoon to prepare, it was apt that he chose the speech title What Would You Do If You Weren’t Afraid? He spoke about how squaring up to the things that scare us, from moving countries to overcoming a fear of heights, can bring amazing personal rewards. 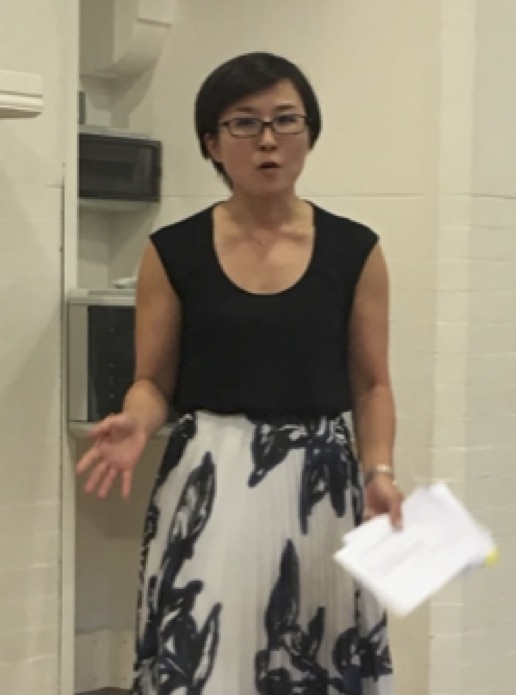 In the second half of the meeting, Table Topic Master Yumi challenged the volunteer impromptu speakers with a particularly tricky task. They randomly selected a subject, object and place and had to craft a spontaneous speech mentioning all of them. 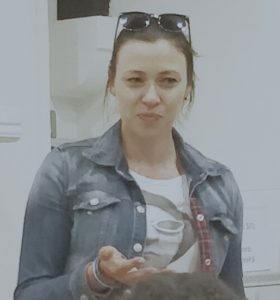 From “receptionist, lip balm and toilet” to “expat, mint and Japan”, this mechanic led to some excellent storytelling speeches, in particular from Eleanor, Andrew and first-time guest, Jeremy. Despite all the drama, there were plenty of laughs and enough inspiration to keep us all working hard on our public speaking. “Every time you open your mouth, you are a public speaker,” said Mohammed, “so you may as well get it right!” Giving up? Now THAT would be a tragedy.